Perhaps the world’s most famous vocal group, the Mormon Tabernacle Choir has long been an iconic part of American music, even called “America’s choir” by Ronald Reagan. If you’re looking for the Utah experience, attending a concert or rehearsal by the all-volunteer ensemble is nothing less than required. 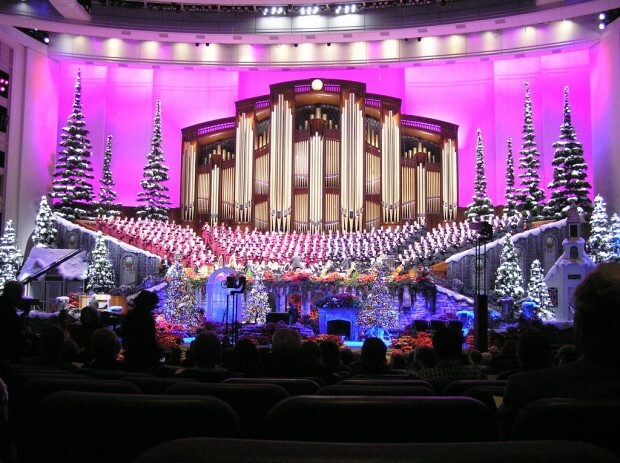 The choir dates back to 1847, when it was assembled for the first ever general conference of the LDS church, singing less than a month after the Mormons settled in the Salt Lake Valley. It didn’t get its name until twenty-some years later, however, when the Salt Lake Tabernacle was completed. In the early days the Tabernacle Choir was pretty much just like any other church choir at the time—fairly small and not all that great musically. But under the direction of George Careless in the late 1800s, the choir increased in both skill and size—almost doubling their current number—and recorded their first song, “Let the Mountains Sing for Joy,” in 1910. Today’s internationally-acclaimed 360-member choir puts out recordings regularly and travels the world, but most of the time they can be found right here in Salt Lake City, Utah. If you’re in town there’s almost certain to be an opportunity to hear them sing. Every Thursday you can go listen them rehearse at the Tabernacle (or, during the summer, at the Conference Center), from 7:30 to 9:30pm. On Sunday mornings you can attend a live broadcast of Music and the Spoken Word, the choir’s weekly radio program. And if the organ accompaniment is what really draws you to the Tabernacle Choir, luck’s on your side—every day at noon there’s a half-hour organ recital by regular or guest organists. The audience for the annual Christmas Concert is drawn by lottery from among interested applicants, but you can listen to the choir anytime anywhere at their YouTube channel. The tabernacle can be found at Temple Square, Salt Lake City, UT 84150.